The Font of Knowledge: Lloyd George; a little bit of history. Lloyd George; a little bit of history. Tempestuous Journey - Lloyd George: His Life and Times by Frank Owen. Hutchinson, 1954. I read this biography during the autumn of 2002. It is in my father’s library. My father had added dates to the chapter The curse of Cromwell (pp 556-588), which dealt with the Irish question during and after the War of Independence. Oddly enough, he added no comments to other chapters despite his familiarity with the period and his propensity to make shorthand and other notes in his books. Lloyd George was born in Manchester in 1863 but lived his early life in North Wales where his father William George, a school teacher, had moved. William died one year later from pneumonia, leaving his widow and two young boys bereft of all means of support. Shortly after his death, Mrs George and her family moved to her brother’s house at Llanystumdwy close by in North Wales. He was Richard Lloyd, who was a boot maker and who was to prove more than a father to Lloyd George and his family until his death in 1921, Richard remained an intimate guide and counselor for Lloyd George. After the latter entered the House of Commons and went to live in London, he corresponded daily with his uncle, even during his busiest political years. 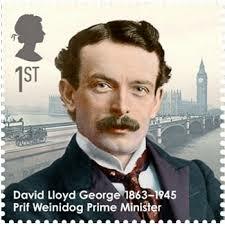 David Lloyd George was an intensely patriotic man and particularly proud of his Welsh heritage. While still a young man, and after graduating as a solicitor, he became a vocal and strong supporter of Welsh Home Rule and of the Welsh language, and he was a bitter critic and opponent of the established Church of England in Wales and of the rich land owners in the Principality. If he had received the unqualified support of the Welsh people he might have successfully espoused the same political movement in Wales which was taking place in Ireland at the turn of the century. He was at all times, particularly during his earlier years, an admirer of the Irish Nationalist leaders as well as being an ardent supporter of Ireland’s claim to Home Rule. However, he could never gain the support of the rich colliers and other industrialists in South Wales who perceived that any political separation from England would threaten their welfare, a reflection of the situation in the North of Ireland vis-à-vis the South. In 1901 he was first elected to the Caernarvon Boroughs where, on the Liberal ticket, he narrowly beat his Tory opponent. He was to remain the Liberal representative of this constituency for the next 57 years. From the date of his election, he maintained the same turbulent, outspoken and courageous approach, which was a feature of his earlier local professional and political activities. From his entry into national politics until he died in 1945, he remained a controversial figure with as many enemies as friends but he was sustained in the forefront of political activity, progress and social innovation because of his energy, generally good judgment and integrity. He had many admirers, even reluctant ones. He deserves great credit for his courage and commitment when, as Chancellor of the Exchequer in Asquith’s government in 1911, he introduced the first effective social benefits for workers, pensioners and the unemployed (some of which did not extend to Ireland). Lloyd George at the age of 53 replaced the indolent administration of Asquith on the 6 December 1916, after Asquith had resigned. It was at a time when the war appeared to be going badly for the British. Lloyd George was to succeed in bringing Britain safely through to victory in 1918. When appointed, he marshalled the talents of both Tories and Liberals as well as the newly emerging Labour Party. He lead a cabinet which stimulated a more active war effort and which eventually accomplished the capitulation of the Austro-German enemy and the end of a senseless, bitter and apparently endless war. Churchill’s role as the inspiration and the spearhead of the British war effort from 1940 to 1945 was reminiscent of, if somewhat more dramatic than, the role of Lloyd George during the latter years of the Great War. At least Churchill did not have to maintain a constant battle with the military and naval leaders while Lloyd George was regularly at odds with the leaders and their policies. parliamentary democracy; the Suffragette movement leading to much destruction of property and general alienation; and increasing industrial unrest leading to numerous strikes and much economic disruption. Lloyd George, as a prominent Liberal, was much involved with these earlier issues and, during and after the war, with constant economic and labour problems. During and after the settlement with Germany in 1919, he was increasingly concerned about the French and their draconian reparation and political demands against the Germans. Soon after the settlement Lloyd George believed that the Germans should be treated more leniently and he was later to espouse a policy favouring the abolition of all reparations, including those owed by the Germans to the victors and owed by the British and French to the Americans There seems little doubt that a more lenient approach by the French to the Germans after the draconian Versailles Treaty might have prevented the rise of Fascism and the Nazi regime. He and his coalition government were re-elected with a large majority in the post-war 1918 election. In supporting a coalition after the war, he was strongly in favour of such a central combination “ending the old party system and all its evils”, a remark which might be appropriate to the current situation in Ireland. Our rigid party system has hardly served this country well, at least in recent years. Many of our current ills can be attributed to our politicians putting the welfare of party and success in elections before the welfare of the country. There are too many instances of failure to carry through necessary legislation because of the opposition of some politicians, inspired by self-interest, and the influence of local minorities and even influential individuals. We do need a party system in a functioning democracy but we should dispense with the party whips, except in certain defined situations, such as finance bills. The post-war British government was soon faced with the deteriorating Irish separatist movement, aggravated by the disastrous effects of the British effort to impose conscription on Ireland in March 1918 and the trumped-up German Plot charge which led to the incarceration of many of the Irish leaders. The author is somewhat disingenuous about the British failings in their policies towards Ireland at this time. Three months after a truce was arranged in Dublin in July 1921, a group of seven Liberal and Tory politicians, lead by Lloyd George, formed the British deputation to meet the Irish delegates. The first meeting was held on the 7 October 1921 and the Treaty was signed on the 6 December. By 1921, Lloyd George appeared to be less sympathetic to the Irish cause, clearly because of the military conflict and the activities of the “murder gang” as he called the IRA. Important considerations arose which affected Lloyd George’s judgment in connection with the worsening Irish situation. He was obviously unaware of the incompetence of the administration in Dublin Castle and did not appreciate the loss of harmony between the Dublin Castle administration, the police and the army. He, his Cabinet and many of their official advisers had a poor insight into the Irish situation and the problems facing Dublin Castle. Nor did the he and the Cabinet appear to have much insight into the huge support Sinn Fein enjoyed in Ireland after the conscription debacle. He failed to co-ordinate the Irish administration by putting General Macready and the army in charge of the war. Macready and the army, according to my father, if in full control, would have had a devastating effect on the IRA’s activities and would have stopped the war without the introduction of the Black and Tans and the Auxiliaries who, by their draconian treatment of the population, drove the vast majority of Irish Nationalists and many Loyalists into the Sinn Fein ranks or at least increased their sympathy for the separatists. While the British army did take an active part in the later months of the War of Independence, its role was diminished by the military activities of the police, the Auxileries and the Black and Tans, and the British refusal to admit that the Irish conflict was a war subject to the rules of international warfare. 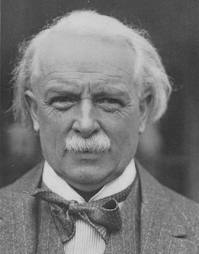 Further, Lloyd George had offered an opportunity of a truce in November 1920, when Bishop Clune acted as a go-between. However, when Clune evoked a positive response from the Irish leaders in Dublin, Lloyd George refused to agree unless the IRA laid down its arms... The worst feature of the conflict, in terms of casualties, atrocities and reprisals was from November 1920 to the truce of July 1921, a truce which was arranged without any conditions about the laying down of arms. An earlier settlement would have made an agreement with the British easier and would certainly have reduced the risk of a subsequent civil war. This was probably Lloyd George’s greatest mistake of his political career and one which was to have a baleful influence on Anglo-Irish relations. The Tory government was later to be guilty of the same incompetence when Cyprus was lost after the Second World War. Of course, Lloyd George, his colleagues and the House of Commons were certainly greatly misinformed by the over-optimistic reports and the deliberate falsehoods emanating from the Irish Secretary, Sir Hamar Greenwood, and Lloyd George himself was under pressure from the more reactionary Tories in the House of Commons, many of whom had little sympathy with Irish aspirations for home rule, let alone Dominion status. Lloyd George was a rugged individualist. He was pugnacious but fair. His enormous energy, courage and sense of innovation singled him out from all the other politicians in the earlier part of the twentieth century. His only rival, in terms of these qualities was Churchill, but Churchill was younger than Lloyd George and, in his earlier years at least, lacked Lloyd George’s judgment and better interaction with colleagues. Lloyd George made many enemies, particularly among some of the Liberals, but, because of his outstanding leadership qualities and his original mind, he never attained Churchill's unpopularity with all parties, at least until Churchill lead Britain to victory in the World War. Once Lloyd George formed the coalition cabinet in 1916, he had probably started the inexorable decline of the Liberal party. This first coalition led to many divisions in the Liberal as well as the Tory party and was to lead to the rise and rise of the Labour party, to a number of unstable coalitions and to several elections before the war of 1939. Lloyd George made efforts to reconstitute part of the Liberal party but he failed in these efforts because of the bitter opposition of those who had sided with Asquith when he was forced to resign in 1916. His refusal to part with a large sum of money which he had collected from various sources and which his colleagues thought, by right, belonged to the party, also alienated many of Lloyd George’s colleagues. Lloyd George resigned the premiership in October 1922 when the Tory Party decided to quit the coalition. He spent his final years paying only occasional visits to the House of Commons and making occasional controversial interventions into the political scene. Before the World War he visited Hitler and he expressed great admiration for the rapid progress Germany was making under the Nazi regime. However, he was less enthusiastic about Hitler and Fascism as the war approached but during the war, at least during the periods of gloom in 1940 and 1941, he was pessimistic about the outcome and supported others who believed that a settlement should be sought with Hitler. the economic and political woes of Britain during the twenties and thirties, while he made a substantial living as a newspaper correspondent and in writing his memoirs. Like many successful and energetic figures in politics and the affairs of the world, he found his gradual departure from the corridors of power to be irksome. He died in his home in 1945, old and disillusioned. He was buried close to his old home in North Wales where his grave is marked by a large stone with no attribution. Why do many people who have achieved great things so often die disappointed and disillusioned?